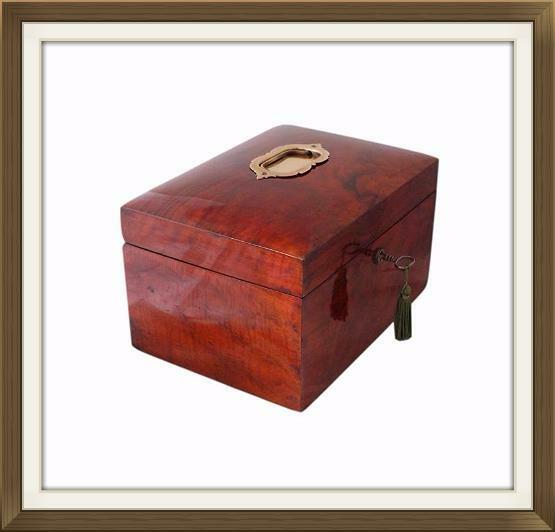 This is a beautiful large Victorian box, dating to 1880. 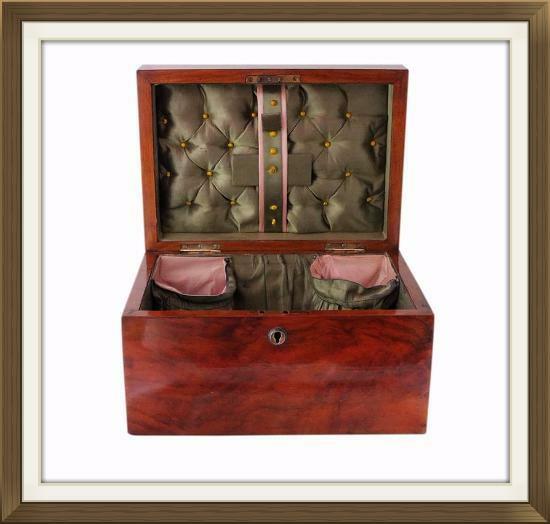 It was designed to store both jewellery and sewing items, and is in complete original condition. 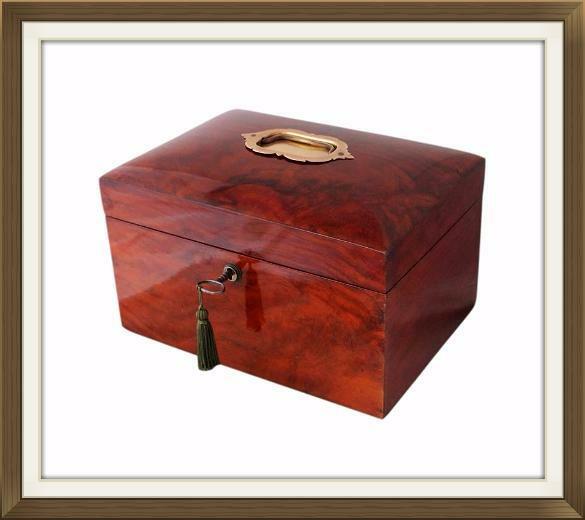 This box has a stunning figured Walnut veneer. 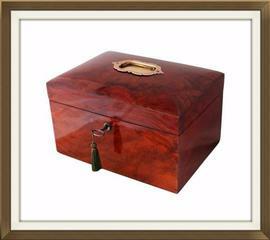 It has a large decorative solid brass plate and handle on the lid, and a raised brass escutcheon to the lock. The figuration within the Walnut on the lid is particularly attractive. The box is complete with its original lock and it comes with an older large Georgian 'bow' key. This securely locks the box. The box is also complete with its original brass stop hinges. These prevent the lid from falling back. The bottom of the box has its original hessian covering. This is worn around the edges but the majority of it is present and intact. It is a lovely original feature of the box and so we decided against replacing it. The interior is completely original. It has a large and roomy deep compartment with two separate storage pouches at the rear. 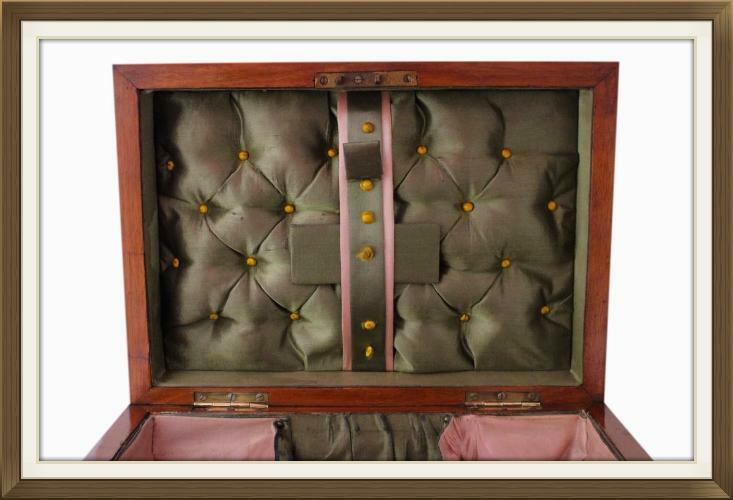 The compartment and its pouches have lovely two tone pink and green silk linings. The panel to the base of the compartment is deeply padded and quilted. This is beautifully finished with gold silk buttoning. 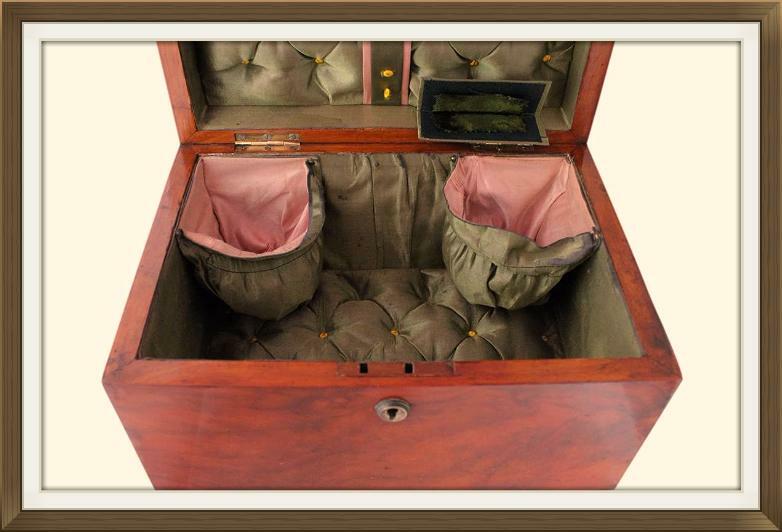 The inside of the lid is lined in a similar fashion and with the same silk. Its panel is also padded and quilted, and has a thick silk ribbon which you can tuck sewing items behind. It also has a lovely silk covered holder for needles and pins. 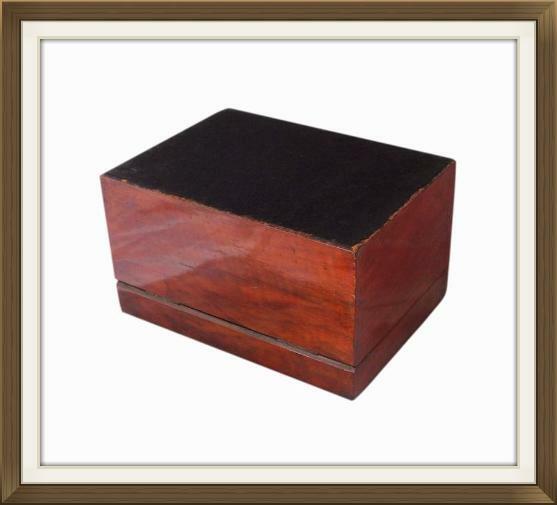 This wonderful box is in great condition for its 130 years of age. It is a well made sturdy box and is structurally sound. The exterior has minor age related wear and some tarnish on the brass work. The interior silk has some stains and minor wear, as we'd expect on a box of this age which has been loved and used for its purpose. We do not recommend cleaning the silk as doing so could spoil its colour and cause it damage. The lock and hinges are in good working order. 22.5 by 15.0cm with a 10.0cm depth. International Postage is by Royal Mail International Signed For. Delivery is fast, within 3-5 working days to Europe, and 5-7 working days to the rest of the world.